I thought of these numbers when my attention was drawn to a post on a somewhat obscure blog which claims, without giving a great deal of even anecdotal evidence, that the Traditional Mass is 'stagnating' in England and Wales. 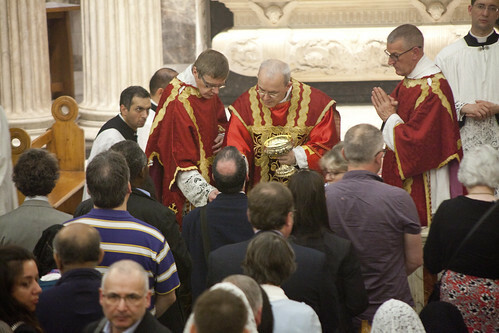 It strikes the author of that post as very significant that the numbers attending, for example, the 11 o'clock Novus Ordo 'bells and smells' Mass at the Oxford Oratory, have declined, in recent years, only a bit, whereas the numbers at the 8am Low EF in the same church have merely tripled, as have numbers at the equivalent, 9am Low EF in the London Oratory. I can't squeeze a great deal of pessimism for the Traditional Mass's cause out of that, but maybe that's just me. I would like to note, however, some of the limits to growth in attendance at the Traditional Mass in England and Wales, and what needs to happen for growth to continue. The first thing for non-residents to understand about England and Wales is that the Catholic population is very low. In the United States, Australia, and even Scotland, Catholics make up about a quarter of the population. In Ireland and parts of Canada, and the historically Catholic countries of Continental Europe, even in these evil days the proportion is even higher. Since the 16th century, however, 10% has been a good reading in England and Wales, and it is currently more like 8%. This means that when the ICKSP and the FSSP and indeed the new Oratories of St Philip Neri set up in English and Welsh cities and connurbations (and they have: Cardiff, Bournemouth, York, Manchester, New Brighton, Preston, Warrington) they have a harder nut to crack that their equivalents in the USA, Australia, and elsewhere. Please stop telling us it is because English Catholics are bad people, lazy, lacking in spirit, or incapable of self-criticism. They have to run twice as fast to keep up with the results you can expect in countries where there are twice, three times, or four times as many Catholics in the general population to start with. This means that, generally speaking, congregations are going to be smaller, and resources more limited. Readers may be interested to know that even the enormous congregation at the 11 o'clock mostly-Latin Novus Ordo in the London Oratory is not remotely sufficient to pay for the music for which that church is justly famous. The money has to be supplemented by major benefactors. Unless we find the Magic Money Tree, weekly music of this standard is not going to appear to accompany the Traditional Mass anywhere in this country any time soon. Another truth about England and Wales is that it is not Singapore: we don't all live in one high-density city. 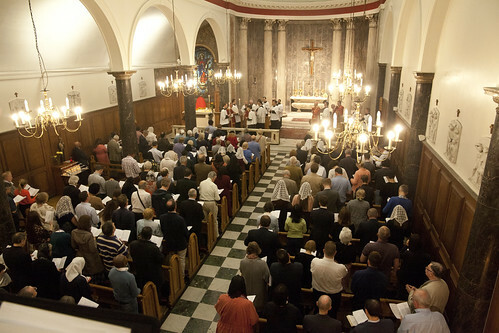 The spread of the Traditional Mass in England and Wales is a matter of getting it onto the parish schedules of more and more churches around the country, so that people can actually get to it. At this point people usually tell me that the Real Trads in the USA think nothing of 4-hour round trips to get to the EF on a Sunday, unlike the feeble people we call Trads here, but I would make two observations. The first is the cost of motor-fuel relative to average incomes in the two places. The second is that as a matter of fact there are a good number of Traditional Catholics who do go to extraordinary lengths to attend the EF, but that is about holding on to what you already know, not trying out something new which you might not like. Getting the Traditional Mass into a new church, as a regular Sunday fixture, is an extraordinarily difficult thing to do in England and Wales. Our churches are heavily used and our priests are fully committed. Only in quite unusual situations can a time-slot and a priest both be made available. And so, yes, in the five years from 2012 to 2017, progress on this measure was of only 6 churches. Not much more than one a year. As the squeeze on the number of clergy serving our churches tightens, the attempt to keep up all the existing Masses has made more and more demands on priests' time. One reaction by the bishops has been to try to protect their priests from impossible demands by stopping them creating new Masses, and trying to reduce the numbers of Masses in parishes - it's not as if they are all full - as well as by closing parishes. Drastic changes occasioned by parish mergers can occasionally make new EF Mass times possible, but naturally that is a very slow business. However, we are winning at a more fundamental level, and this fundamental victory will in time be reflected in the number of Masses. What I mean is in the attitude of bishops and priests, particularly the influential senior clergy, to the Traditional Mass. Ten years ago, and before that, there was a great deal of hostility. While some still cling to that, for the most part this has melted away. It has done so partly as a result of generational change, but also because as the EF has become more widespread and normalised, everyone has been able to see that it, and the priests who say it and the people who attend it, are not freaks or monsters, but faithful Catholics. Not only is the hostility disappearing, but the number of priests able and wanting to celebrate the Traditional Mass grows with every year that passes. The younger seminarians are not all keen on it, but if 50% of the brighter ones are, things are going to look very different in 20 years' time. And then there is the extraordinary number of vocations to the Traditional Institutes, notably to the Fraternity of St Peter, which have come from England and Wales. Another issue to bear in mind is that, from the point of view of liturgical renewal, the Traditional Latin Mass has become, for practical purposes, the only show in town. The theoretical and practical impetus for 'Latin Novus Ordo' and varieties of 'Reform of the Reform', which have never spread beyond a tiny number of churches in this country, is played out. True, lots of people still go to the Latin NO in the Oxford and London Oratories, but no one is going to create new ones in new churches. It is a complete liturgical dead-end. And here is something else. The experience of the last ten years has taught us that when the Traditional Mass is established in a new location, where there is little if any proven demand, it attracts a congregation. With the Traditional Institutes' new churches, this can be a congregation comparable or bigger than the typical prime-time congregation of nearby parish churches. Where we are talking about a church offereing both Forms, and if the Mass times provide a reasonably level playing-field, it can become the most popular Mass of the day. This has happened again and again, and reinforces my point that to spread the Traditional Mass what is needed, in the end, is for it to get into more churches. It is frustrating to see so many priests who'd like to celebrate the EF on a Sunday in their churches not able to do so. But this pent-up supply is not going away: it is increasing. And when it is able to manifest itself in a new local Mass, it creates its own demand. I'm optimistic about the future of the Traditional Mass in England and Wales, because of these longer-term trends. I have seen the transition from a generation of openly hostile senior priests and bishops to open-minded ones with other, urgent, issues uppermost in their minds. Knowing what the younger clergy are like, I forsee another transition among senior priests and bishops: from seeing the Traditional Mass as an eccentricity to be tolerated, or an opportunity for the off-loading of a crumbling historic church, to seeing it as a evangelical weapon to be deployed. When that day comes, will we be ready? We are ready Joseph!Keep up the good work.God Bless. I visited my diocesan seminary recently on a parish outing and asked the Priest who showed us round if the next generation of Priests were learning the Extraordinary Form. Sadly the answer was a definite 'no' and he added 'but one or two might want to go elsewhere to learn it.' So no encouragement there whatsoever which saddened me greatly. I remember on one occasion in Lourdes when the Credo was being sung at the beginning of the Torchlight Procession an English Priest standing nearby chatted and laughed with his parishioners all the way through. I presume he had never once sung the Credo and so was unable to recognise it when it was sung at an international gathering such as at Lourdes. A shocking example to any non-Catholics who may have been present nearby. 'One or two...' Out of how many? Three or four? The diocesan seminaries don't teach it of course. Well St bede's has 14 altar boys between the ages of 7-15, and another 14 boys under 7! Hopefully this will help with the priest shortage in 15 years or so. That is a great improvement looking back over the 20 years we have been at St. Bede's.